T cells are vital to fighting all types of invaders and to fix trauma using cytokine signals, physical attack, and various forms of inflammation. 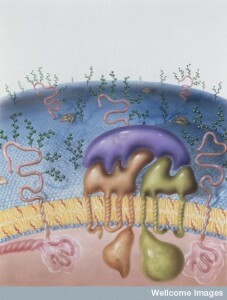 They either directly attack cells to kill them, influence the development of many different kinds of inflammation by orchestrating other immune cells, regulate the extent of responses by tamping down unnecessary potentially destructive reactions to food and other “foreign” material, and remember for decades the exact responses needed for a particular type of attack in a particular organ. 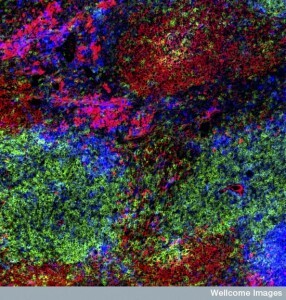 T cells can also advertently orchestrate widespread damage to bodily organs in responses to “self-antigens” that have gone awry, such as in multiple sclerosis, arthritis, and diabetes. One job they sometimes take on is attacking cancers. Because of the great variability of cancers among patients, cancer types, and even various cells from sub clones of one cancer, their responses can be very diverse. Both the innate and adaptive immune responses can attack cancers, but immune cells can also be manipulated to become part of cancer’s supportive network of cells. There are immune cells that thrive inside of solid tumors. 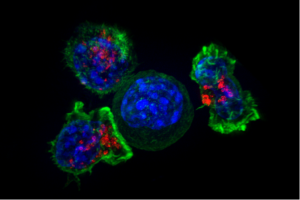 T cells can attack cancers if they consider antigens from cancer particles as foreign. The processes of signaling among T cells and their supportive immune cells are complex and can both support cancers as natural tissue or attack it as foreign cells. 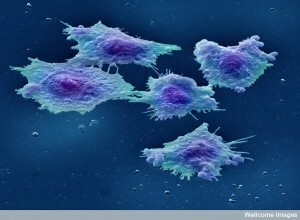 The communication between T cells and cancer cells are just being discovered. Cancer has been called the wound or inflammation that doesn’t heal. It goes on for a very long time and thrives on inflammation causing more mutations. T cells are more used to attacking a microbe, using huge brute force, and then tamping it down to avoid damage. For cancer, the attack has to be gradual with less ancillary damage, and also has to continue for a very long time. Some of the other types of T cells have long memories or use regulating functions like tamping down infections after they have run their course. For an ideal T cell to fight cancer, they need receptors and signals that both maintain the memory of the cancer cell, avoid exhaustion of the T cell, and fight in a long slow process. For microbes and cellular damage, T cells respond to a particle presented on the surface of special presentation cells, in a groove called the MHC (major histocompatibility complex). Once activated, the T cell often produces many unique receptors that work together to grab onto a cell, or to produce special cytokine signals. For cancers, multiple unique receptors and other molecules are necessary to attach to the each type of cancer cell. New treatments using T cells to attack cancers attempts to use these multiple receptors to go after, grab onto, and destroy cancer cells. The secret of this new process is that it uses newly designed receptors that grab onto the cancer cells in unique ways. They can hold on until the cell is killed. Also these receptors add strength to the normal process where a T cell is attracted to a cell for destruction. T cells operate through a very elaborate set of receptors and signals that determine conversations with other cells and the outcomes. Recent attempts at making designer T cells must take into account the types of conversations that all of these T cells engage in. This post will briefly outline the current state of research into designer T cells. The old immune therapies used antibodies, transplants of a system of cells, and stimulation of immune responses by vaccines. New T cell therapy is based on understanding sensors for signals, the processing of the signal information, and signal responses. Because of the free traveling nature of T cells, altered T cells were first used with B cell cancers that are also free traveling and easier to get to. There are a series of receptors on T cells that are needed to continue functioning against B cells that are abnormal. T cells have been altered to recognize B lymphocyte cancers with a high rate of success. This is true for leukemia as well (a cancer of white blood cells, leukocytes). 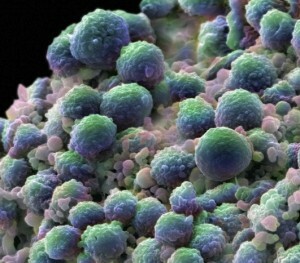 This technique is just being studied in solid tumors, which are much more difficult because of the tight terrain and the many connected cells. Previous treatments included T cells being infused unchanged for the solid melanoma. Melanoma treatment uses T cells found inside of tumors (Tumor infiltrating lymphocytes are called TILs). These can target specific molecules that occur on the tumor. These use the existing receptors (T cell receptors or TCRs). It can detect the many peptides that are advertised in the MHC system. These also include the vital specific cancer related molecules from a mutation. Problems with this approach include being able to produce a large enough amount of T cells and the fact that thousands of possible peptides from the cancers can have very low attractiveness for the T cell. These molecules from the cancer have low attractiveness because they are similar in many ways to existing normal molecules. When T cells attack viruses, they base their attack on picking up a very different kind of molecule, which produces great attraction for even very small amounts of molecules. A system was developed where molecules are manufactured that can become new types of targets of the T cells. They use a new receptor that is different from the usual MHC process. Therefore, it can be stronger than the usual process whereby molecules are presented to T cells in a groove on the surface called the MHC. This receptor and process have an unusual name based on the fact that it combines molecules from different creatures (called chimeric antigen receptors or CARs). These CARs can target other molecules on the cancer rather than using the traditional MHCs. One particular molecule was chosen from B cell cancers called CD19 for this process. This appears to be a vital part of B cell function, as well. The results can help eliminate the cancers, but have other side effects. Other molecules were used as receptor for multiple myeloma cancers. A very new technique allows CRISPR to move the CARs to different places, where they can be even more stable. One side effect of this technique comes from the inadvertant stimulation of cytokines. This technique can produce cytokines that cause problems when treating acute lymphoblastic leukemia (ALL), including neurological symptoms. Targeting the cytokine IL-6 has helped the side effect syndrome. With chronic lymphocytic leukemia it does better. Another problem of the CARs technique is B cell dysfunction, that is destroying normal B lymphocytes. To avoid this problem there needs to be a new type of CARs that can alter its approach to the situation, after the cancer is hit. Many other problems in this method currently include dying off of the T cells, recurrence of cancers in a different way, or a switch of the cancer to a different type. At first T cells were used against solid tumors using a completely different philosophy. They were used along with powerful drugs and radiation. Older versions of drugs and radiation caused indiscriminate killing of many kinds of cells and therefore many terrible side effects. It was thought that infusing T cells replenished the damaged immune cells from the treatment. Only later was it learned that they were not replacing cells, but the T cells were operating against the cancer. Later, it was learned through twin studies that placing T cells from other patients could attack solid cancers. Then, this treatment worked with chronic myeloid leukemia (CML a deadly cancer of myeloid blood cells). The main problem was the reaction to non-self-cells called graft v host disease—T cells going after the patient’s molecules. This can kill the patient causing diseases in skin, gut, liver, lymph, bone, lungs, (not brain and muscle). This occurs both from behavior of the outside T cells and also awakening local T cells. It didn’t work very well in general, but was viewed as a future possible treatment. It was then noted that natural T cells can stop leukemia or graft disease. But, the results were limited. With engineered CARs, there are new behaviors of the T cells and new treatments. 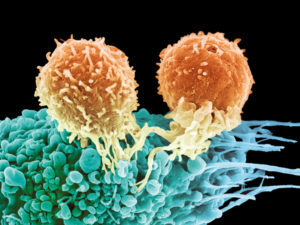 Natural T cells do respond to molecules specially placed to provoke a response to attack the cancer. 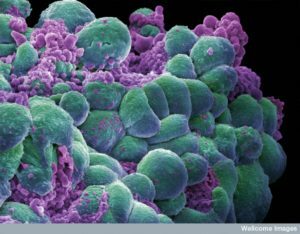 T cells were altered to respond to particular molecules that are located on cancers. Different T cell receptors provoke very different responses, some weak and some devastating to skin, eyes, hearing, etc. The number of different receptors utilized by the T cell can increase the response positively or negatively. Each has different attraction to the MHC complex (the usual place that molecules are presented to T cells). Some additional receptors helped the common receptors, such as CD4 and CD8. Current trials use new types of targets (MART-1 and HLA-A*0201). It is not clear if these work like CARs. Another new trial uses CEA, which hurts the tumor and can cause severe inflammation and toxicity as well. Another new receptor being used has helped several cancers. But, two other different trials caused brain damage. Several CAR studies didn’t work targeting CD171 and didn’t have any toxicity. Several had toxicity, without any effect on the tumor. Certain details have been discovered in these trials. The target must be very specific to the tumor. The target must have receptors that strongly attract. They also cannot have a response to certain medications that try to dis inhibit T cells. The pathways that inhibit T cells naturally are called check points. These keep T cells from causing damage with too much activity. Drugs that try to release the T cell activity, must overcome these check points and are called check point inhibitors. What has been found is that the T cell receptors cannot respond to check point inhibitor drugs. It is not yet possible to predict what will happen with receptors that have strong attraction. Some peptides are similar to cardiac muscle and kill the heart cells as well. This is difficult since there are so many molecules in the MHC groove. CAR receptors have been developed using large screens of normal tissues to avoid these similarities to normal tissues. The following summarizes some of the latest research into developing T cell receptors and signal pathways that might help fight the cancer strong enough, long enough, and without causing severe problems. Some of the issues are listed here. Trafficking: T cells must go to the targeted molecule despite terrain and cytokines that help travel of the T cells. Recognizing Cancer Cells Avoiding Others: Are the targets specific enough? All therapies thus far have killed some other cells. With CARs, normal B cells are killed. With TCRs, T cells can attack normal tissues. CARs are only to responding to surface molecules. Some antigens are only in some versions of the cancer cells. Different tissues can have different amounts of various molecules. Proliferation and Persistence: The T cells must last and multiply for effect against the cancer. This is more difficult in solid tumor than against B cell cancers. Different Microenvironments: Solid tumors have a very controlled environment, where the local cells have become comrades and suppress immune activity and specially stop T cells without additional help. Can engineered cells survive, and influence the environmental cells? Control: There is a need to tamp down side effects such as regulatory T cells, especially as they become more powerful for solid tumors. In fact, it is the usual regulatory T cell machinery that is used against them. There is a need to alter and modify the T cell survival in the cancer environment. New Receptors – Integrating Multiple Receptors: One type has activation occurring when both receptors are triggered. Another type activates one receptor which triggers the second that kills the cancer cell. This type only happens when both are present. This system can discriminate very accurately between cells with both and only one. Another type avoids the double targeted cell. It stops activation when a second negative molecule is found on the nearby cells. Another method has two independent targets. Lasting A Long Time: When there are additional receptors triggered, they tend to last longer. One type lasted for a decade without problems. Those with the same receptors without an additional did not last. These were destroyed by the environmental co-opted cells. One type uses both CARs and CD28 receptors that stimulated the cytokine IL-2, producing more T cells, and controlling the environmental cells, which stopped rejection. An additional receptor 4-1BB made it last even longer until cure. One works rapidly and the other hangs around for the long haul. Other receptors triggered new kinds of T cells such as Th17 that were helpful. To discover the vital factors that are needed, both human and mouse experiments are ongoing. Aging: There are differences in aging of T cells in humans and mice. The vital molecule p53 regulates aging in humans, but not mice. The p53 pathway is often involved in cancers. Human T cells have different telomere sizes. Longer might be better for treatment since they will probably last longer. Enzymes can increase telomere length. CD28 also increased telomere length. IL-15 increases it in CD8+ T cells. Exhaustion of T cells: With long standing inflammation, T cells become exhausted. Exhaustion has many phases and is different from death of the cell. Exhausted cells gradually cannot replicate. 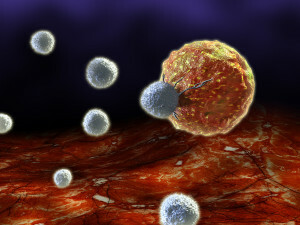 As the tumor grows, T cells are stimulated to exhaustion by signals. PD-1 can be blocked and stop the exhaustion. Another exhaustion factor is related to long acting memory cells. Memory T cells have many sub types. One is called TCM or T cell central memory and another TEM or T cell effector memory with different abilities to respond. Tumor signals alter all of these. 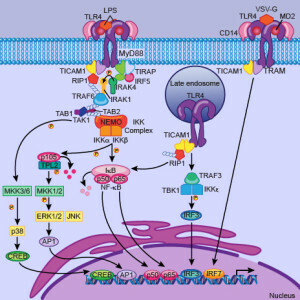 Again, the pathways to exhaustion include the signal and receptor PD-1. T cells have different phases of metabolic activity including a very quiet phase and a very activated state. Normal T cells use sugar or fatty acids making ATP. With activation of receptors it changes for T cells rapidly replicating. Memory cells change again to a quieter state. Memory cells have dense fused mitochondria, and active cells small distinct ones. Cancers try to starve immune cells by rapidly taking nutrients. 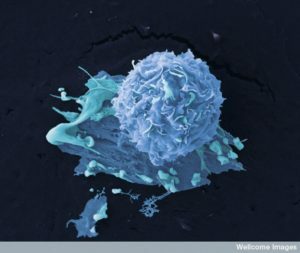 By altering T cells, they can keep up with the metabolic changes. The competition is with sugar and amino acid glutamine. These need the receptor CD28. So the T cells with greater CD28 have stronger mitochondria and metabolism. L-arginine regulates amino acids for the cell and increasing it helped T cells last longer to fight cancers. Potassium is five times greater in the cancer micro environment, possibly from dying cancer cells and this slows T cells. By engineering better potassium pumps it helped T cell activity against the cancer. Also, epigenetic tags can affect metabolic states of T cells. Altering Checkpoints to Enhance T cell Activity: Checkpoint inhibitor antibodies (anti PD-1 and others) stop checkpoint proteins and help T cells become more active and aggressive. These are used with CARs and TCRs. Also, T cells have been made without the receptor to the check point. Stopping the effects of checkpoints on T cells can also be problematic and cause expected problems. Altering Environments: T cells can alter the environment cells. They can make IL-12 or IL-18 which affects many immune cells. The life of the T cell is vastly complex. T cells can be the most important helpful master regulator of the immune system. T cells can also become dangerous causing major illnesses, such as multiple sclerosis, rheumatoid arthritis, and diabetes. All of this is based on the language of cellular communication via receptors, cytokines, and other messages. As well as great complexity in T cell signaling and function, cancers are being found to be extremely complex. No two cancers are exactly the same in one person, in one type of cancer, and in one metastatic colony. A previous post described the communication that occurs among many supportive cells enlisted to help the cancers in their local and in the immune and blood vessel system. By learning to decipher the conversations among T cells and cancer cells, specific signals and receptors are being identified that will eventually enlist our own T cells to help in the fight against specific cancers. As we learn the details of T cell conversations and cancer conversations, this type of treatment will encompass more and more types of cancers. 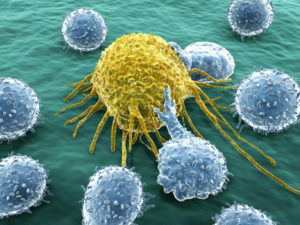 This entry was posted in Blog, Cellular Intelligence and tagged CARs are new types of T cell receptors to attack cancer. Bookmark the permalink.